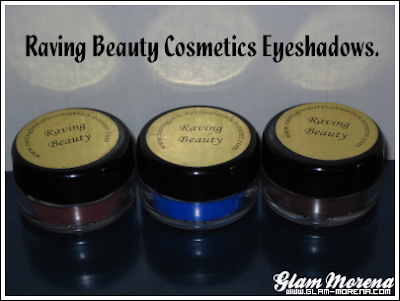 Glam Morena: Review: Raving Beauty Cosmetics + FOTD. Review: Raving Beauty Cosmetics + FOTD. Today I will be reviewing Raving Beauty Cosmetics. 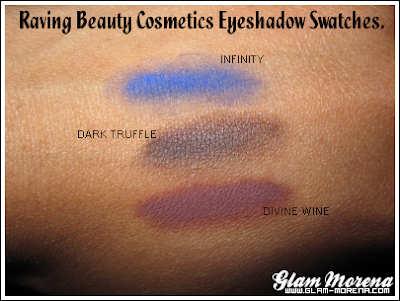 Raving Beauty offers eyeshadows, jars, lipgloss, and makeup brushes. The eyeshadows come in a 5 gram jar($5.00) or zip lock baggie with 1/4 teaspoon ($1.50). I personally picked out all three shades that I'll be reviewing. Divine Wine: This has a blue, burgundy, maroon hue. Infinity: This is a medium blue with red undertones. Dark Truffle: Flat dark brown. There is no base under these eyeshadow swatches. The eyeshadows are matte and are really pigmented! What I loved about Raving Beauty is that they included some sifters with my order. Sifters definitely help to not create a big mess when you open the lid of the eyeshadows. THAT WAS A BIG PLUS! 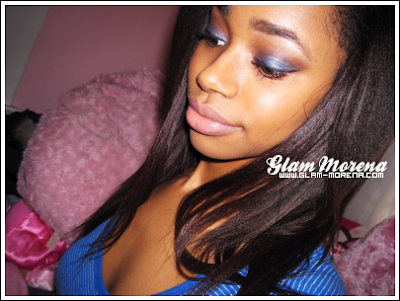 As with most eyeshadows, you'll need to apply a base to keep them from fading away. EYE OF THE DAY FT. RAVING BEAUTY. Infinity is on my lid and Dark Truffle in my crease. Click here to visit Raving Beauty Cosmetics today! BE SURE TO ENTER MY HEAD & SHOULDERS GIVEAWAY! Today is the last day to get your entries in. 11:59pm CST to be exact. Disclaimer: Raving Beauty provided me with the products mentioned in this post. I know this is not at all what the post is about, but you lips look SO good in the fotd! lol what lipcolor are you wearing? Wow, 'Dark Truffle' is really beautiful! $5 for the jar of eye shadow is a great buy as well.